Knowledge management is an absolute requirement to improve efficiencies and enable a service desk to expand its services or deliver self-service. Yet often it is considered optional, and either not done at all or not done well. Knowledge management is more than just the creation of a knowledge base and the use of a tool – it’s a critical process for capturing and reusing the assets of an organization. 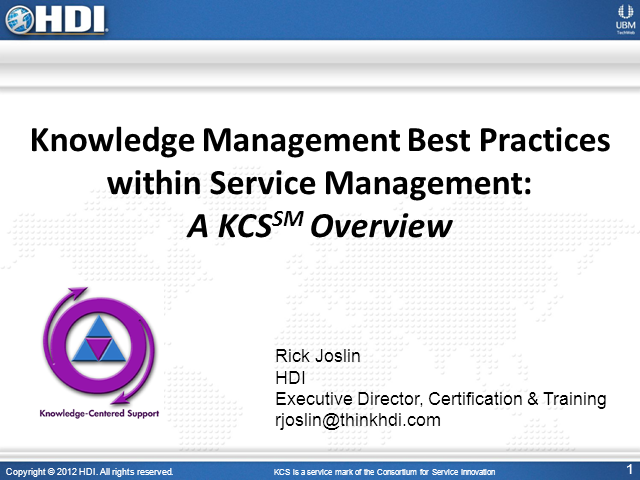 Through this session, you will be introduced to knowledge management best practices that compliment ITIL and how they integrate with the incident management process. Rick Joslin is the Executive Director of Certification & Training for HDI. He is responsible for the development and delivery of HDI’s training and certification offerings. He is a certified Knowledge-Centered Support (KCS) instructor and has guided organizations through the implementation of KCS. Formerly, Rick was the VP of Customer Care, VP of RightAnswers.com, and VP of Knowledge Engineering for ServiceWare, and Manager of Commercial Systems Support for Westinghouse Electric. Rick is the author of the HDI Focus Book on Knowledge Management, the Knowledge Management Maturity Model, and the Knowledge Management chapter in the HDI Service and Support Handbook. He is an author, speaker, and recognized expert in the Knowledge Management field. Rick has served on the Consortium for Service Innovation’ KCS Program Committee, on the HDI Strategic Advisory Board, HDI Member Advisory Board, and HDI International Certification Standards Committee before joining HDI in 2006, as a judge for the 10 Best Support Websites sponsored by the Association of Support Professionals, on the Eservice Standard Advisory Board sponsored by Service & Support Professionals Association (SSPA), and the Advisory Council of Indiana University of Pennsylvania's Business College.